Lubricity dry mouth spray is a unique flavorless, odorless saliva substitute that is designed to relieve the symptoms of dry mouth. Lubricity acts rapidly and provides up to 4 hours of relief when used as directed. Our product comes in a convenient 2oz. leak-proof bottle, & is a travel friendly solution for those on- the-go. Lubricity provides daily relief for a whole month (full 30-days). This makes it a convenient, cost-effective solution for dry mouth symptoms. Lubricity is a proud sponsor of the Sjogren's Syndrome Foundation! Spray Lubricity directly inside the mouth 3 to 5 times per application. DO NOT spit out. Use Lubricity after meals so food doesn't wash it down and minimize the healing effects. Use before going to bed so the mouth stays lubricated and hydrated while sleeping. Use "as-needed" throughout the day. To maximize the effects of Lubricity it is important that it is used consistently for 72 hours. 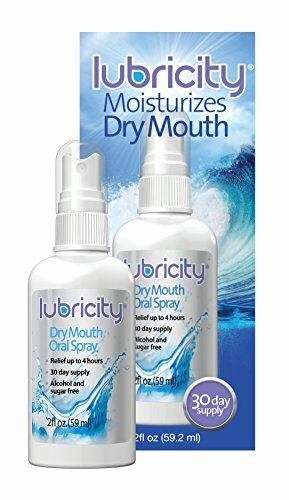 Lubricity Dry Mouth Spray's intended use is to relieve the symptoms of dry mouth. Lubricity has ONLY 5 Ingredients and is alcohol, sugar & gluten free. One of the ingredients Lubricity utilizes is sodium hyaluronan which is known as "Nature's Lubricant" & functions like natural saliva. In a clinical study over 70% of subjects rated the test product better than their usual remedy. If you have any questions about this product by Lubricity, contact us by completing and submitting the form below. If you are looking for a specif part number, please include it with your message.